Chicken Feeders and Drinkers Australian Made by Dine a Chook. Now Stocked by Dine A Chook UK for immediate Fast Delivery to Ireland, UK and Europe. 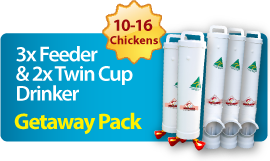 Your search for the Best Waste Reducing Chicken Feeder is over. 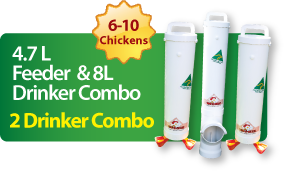 With over 50,000 Units sold world wide, Dine A Chook is the Number One name is Quality Australian Made Chicken Feeders and Drinkers. UV Resistant, Super Tough Australian Made PVC designed to last. Our unique Silo Inspired Patented Feeding Bay stops Hens from Thrashing and Raking feed onto the ground. This saves you instantly on Wasted feed. Our Patented Rain Hood and Gutter System stops Feed spoiling from the wet weather. The elevated design helps to prevent Rats and Mice. Plus there's our unbeatable 10 year guarantee. 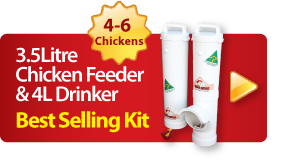 Together with Good Coop Management the Dine A Chook Chicken Feeder and Drinker Systems keep Chooks fed and hydrated with minimal fuss.